WHY DIDN'T MAINSTREAM MEDIA COVER THE SPEECH of the Navajo Code Talkers President? They couldn't honor the code talkers, either? 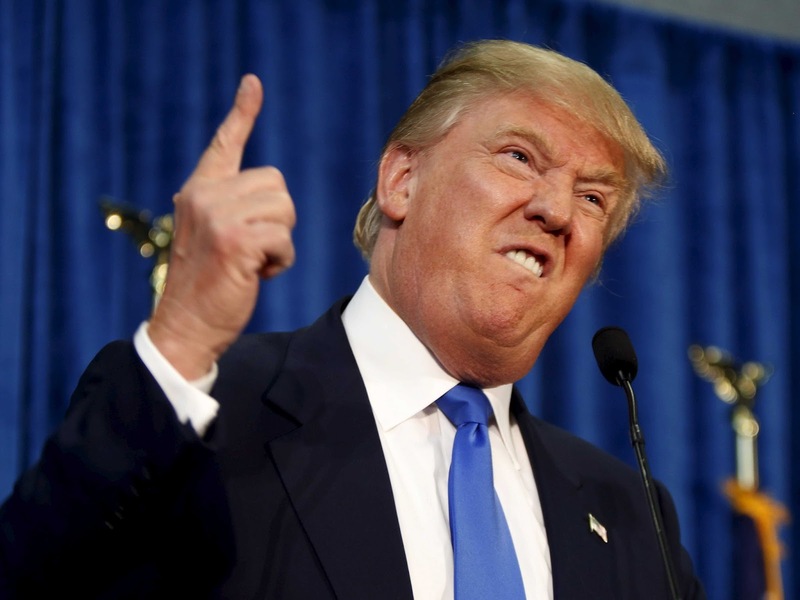 In this episode of Native Opinion, our discussion includes our deconstruction of Trumps most recent insult of Indian country…his use of the word “Pocahontas”. Also, why didn’t mainstream media cover the speech of the president of the Navajo Code Talkers? We fix that by playing what they wouldn’t. We look at the veterans who went to Standing Rock one year later. 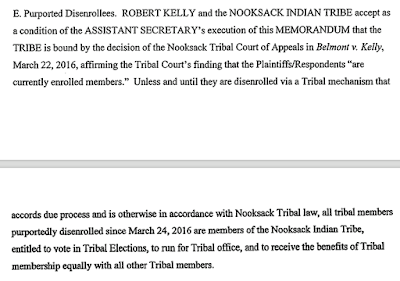 Nooksack tribal chairman Bob Kelly said he plans to start a new round of disenrollment hearings this week following an election that seemed to favor incumbents but was clouded by allegations of fraud. Kelly and his council allies have been trying for five years to kick roughly 300 members out of the tribe, launching a divisive dispute about lineage and power that has gotten national attention, sparked federal intervention and raised broader questions about tribal disenrollment nationwide. 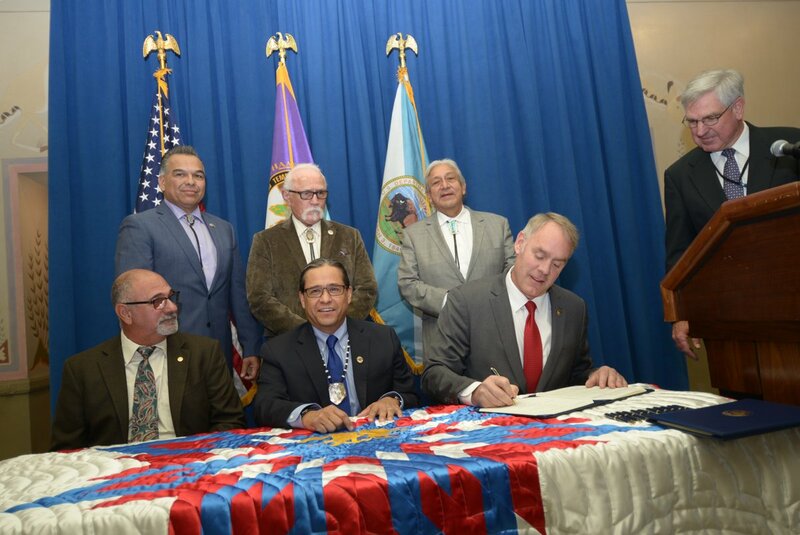 Trump's new Interior Secretary RYAN ZINKE gives a civil and human rights abusing tribe water rights that should include reservation allottees. WASHINGTON – U.S. Secretary of the Interior Ryan Zinke and Mark Macarro, Chairman of the Pechanga Band of Luiseño Mission Indians today signed the Pechanga Water Rights Settlement Agreement (Agreement), formally executing a Congressionally authorized pact that protects the Pechanga Band’s access to groundwater in the region and provides the tribe with more than $30 million in federal funding to pay for water storage projects. 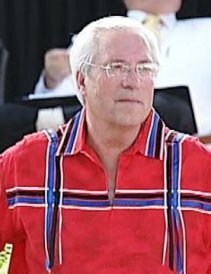 “I’ve been doing the math and it just doesn’t make sense to me,” said Robert Doucette, who ran on a slate promising change in a tribe riven by bitter division over a long-running disenrollment effort. 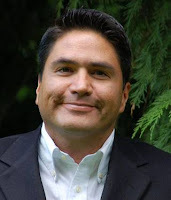 Seattle attorney Gabriel Galanda, who has long represented those facing disenrollment, attracting national attention, has now taken on Doucette and other members of his slate as clients. 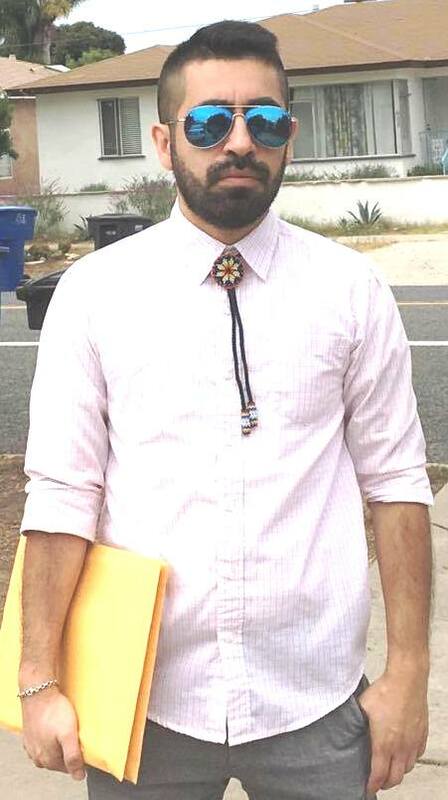 On Monday, Galanda filed a challenge to the results with the tribal election board. He said he also plans to lodge a protest with the Bureau of Indian Affairs (BIA). 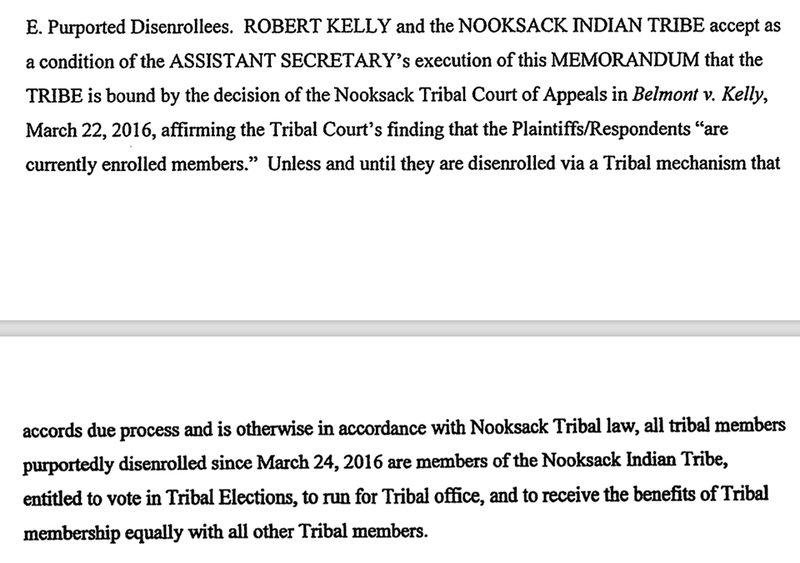 Kelly and aligned council members sought to kick out roughly 300 members in a dispute over lineage and power, the tribal government stopped tending to other matters and resorted to unusual means to enforce its will. It fired a judge for opinions it didn’t like, disbarred Galanda and called off an election that was supposed to be held in 2015. 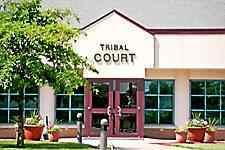 With some Nooksack council members holding onto power after their terms had expired, the feds deemed the tribal government illegitimate and denied the tribe millions in federal funds. The election was a prerequisite for getting that funding back. You don't often see this, a liberal website going against a liberal politician, so you have to give credit where credit is due. This OP-Ed, I am Cherokee, Elizabeth Warren is NOT by Cherokee citizen Rebecca Nagle, gets to the heart of the matter: She is NOT Cherokee, She benefitted from lying, she should APOLOGIZE and even HAS an apology that Warren can use. Elizabeth Warren is NO champion of Indian Country, because she is NOT INDIAN. Read the article linked above. We posted yesterday on President Trumps insensitive remarks at an event honoring Navajo Code Talkers. This drew a response on twitter from Senator Elizabeth Warren, who is well known to have appropriated native american heritage for her own benefit. She tweeted: ".....he came after me with a disgusting slur"
Well, maybe, especially after he called her "Pocahontas" who was a real Indian. Fauxcahontas, would imply she's a wannabe, a fake, an imposter. I have the link that details her ancestry that Cherokee genealogist Twila Barnes did after the jump from a story in 2014. Elizabeth Warren needs to stop, too. 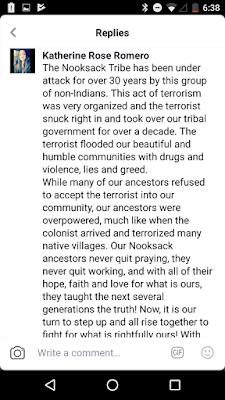 When non-natives take identities that do not belong to them, they help create a myth-laden society that normalize the disrespect we saw yesterday. Just stop. Remember in her 2012 campaign, when she REFUSED to meet with REAL Cherokees on her theft of ancestry? Remember we posted that Warren's pet agency the the CFPB harmed actual Indians? 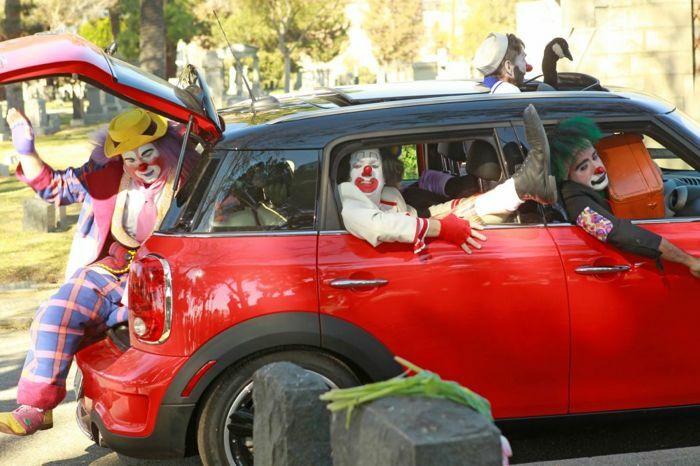 Yeah, that agency is back in the news again. 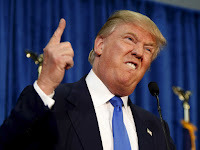 Trump has his own problems, created by himself. He should be adding to them by ill -timed jokes at events that deserve real honor and respect. And WARREN should own up to her lies, apologize and STOP...JUST STOP. 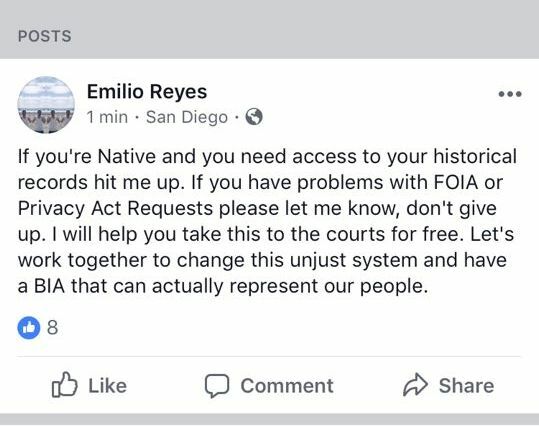 Here's a chance for ALL Natives to help OTHER Native Youth. This new Native American Club at WINDSOR HIGH SCHOOL, in Windsor, CA need fundraising help. 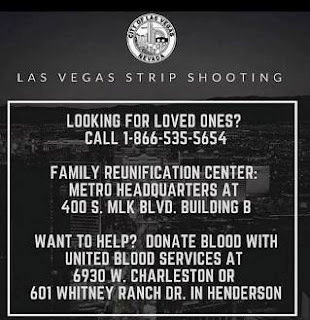 The details are in the flyer below. 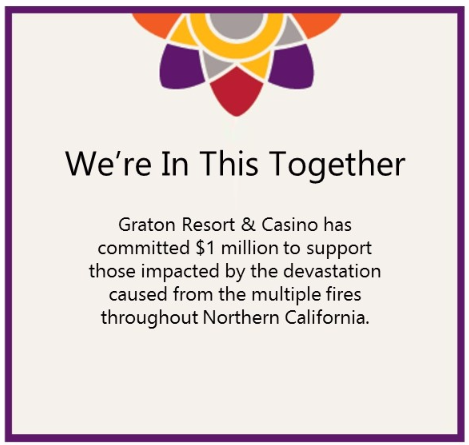 Many tribal youth are represented (Hopland, Covalo, Dry Creek...) and some tribal organizations may help. But your help can start to build their legacy. Nooksack Vote Count To Be Done in Secret. 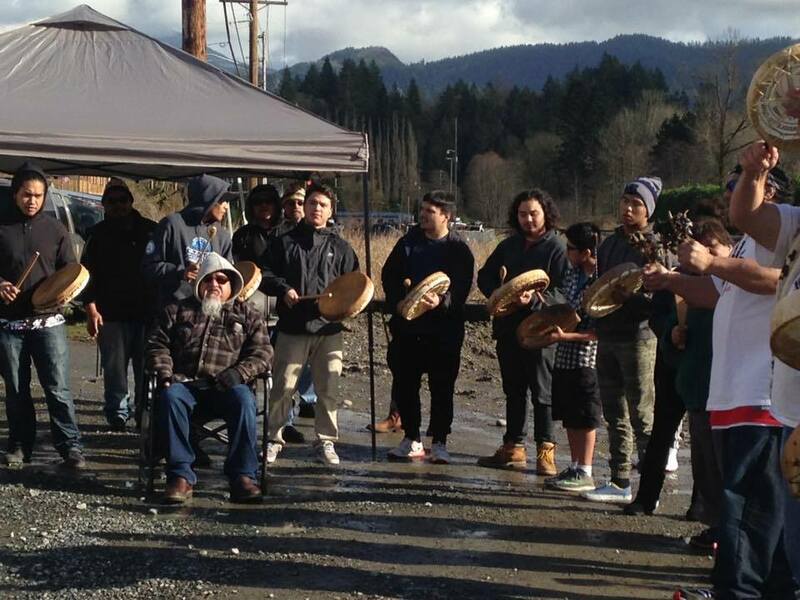 Because TRANSPARENCY is Not the Nooksack Way? 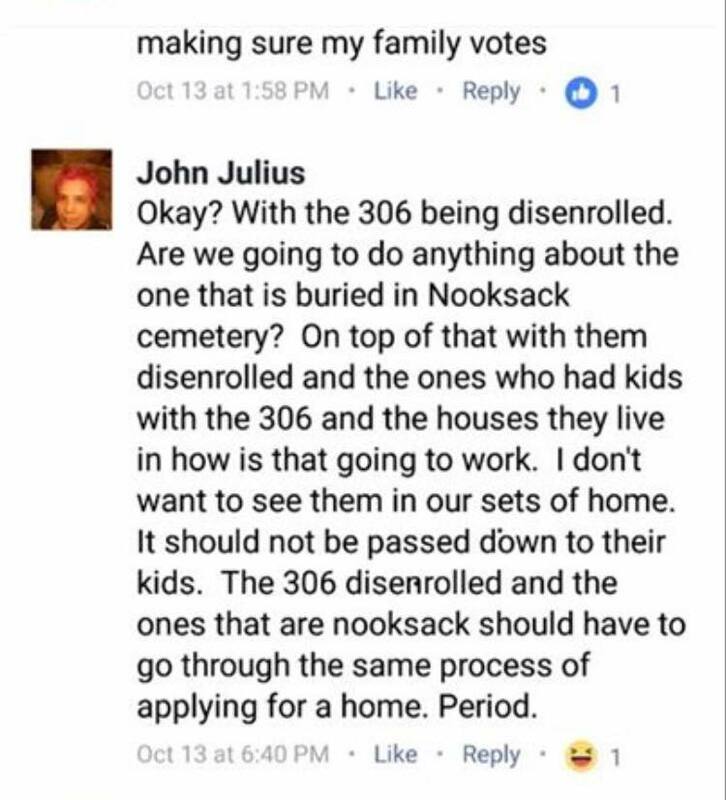 Spotlights make the best disinfectant, and that's why the BALLOT COUNTING for the Nooksack Tribe will be done behind closed doors. For everyone's safety, the Nooksack Tribal Council Election Ballot Count on December 2, 2017 will not be open to the public. The Election Board, Tally Markers, BIA Observer(s) and the Nooksack Tribal Police will be present to witness the ballot count to provide assurance to the public that ballots are counted without tampering of any kind. Unofficial results will be posted at the conclusion of the count at the Nooksack Administration building, the Tribe's website and the Tribe's Facebook Communication page. The BIA has been informed of this decision. Just stick to the script Mr. President. 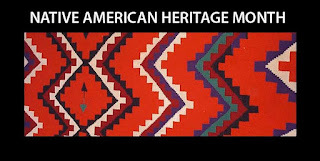 It's true, that Elizabeth Warren is a WANNABE and a heritage thief. Readers can find her detailed genealogy done by Twila Barnes who writes Thoughts From Polly's Granddaughter blog, but disparaging a REAL Native, Pocahontas, and using her name in a derogatory manner, IS CULTURALLY insensitive. President Begaye said the Navajo Nation does not want to engage in this dialogue between Sen. Warren and President Trump. 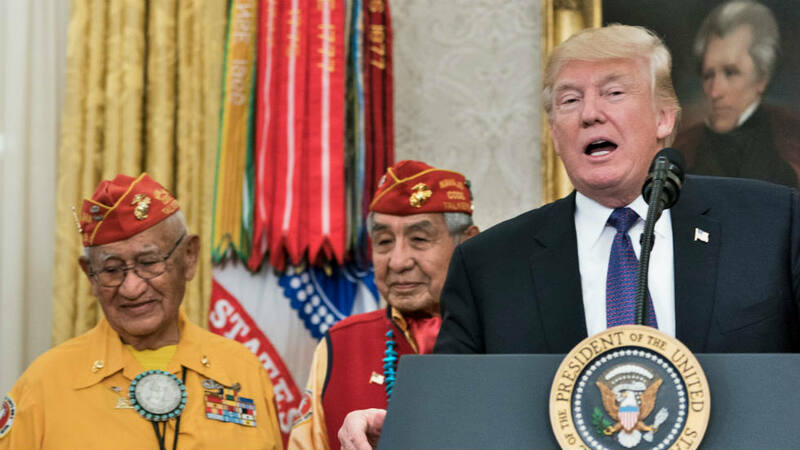 “It was our Code Talkers that ensured the freedom of the United States and that’s what is important to remember here,” President Begaye said. Fauxahontas, or maybe IRON EYES WARREN after FAKE INDIAN Iron Eyes Cody? After the crimes at Pechanga of Murder, attempted murder, carjacking and beating of a customer (by Pechanga Security no less) tribe holds active shooter exercise. The surreal scene was part of a planned active shooter training exercise Wednesday night, Nov. 15, which included members of the Riverside County Sheriff’s Department, Riverside County Fire Department, the FBI and Pechanga Tribal Rangers, among other agencies. Jason Keeling, fire chief for the Pechanga Fire Department, said recent active shooter situations made members of the department decide it was important to start training for such incidents. 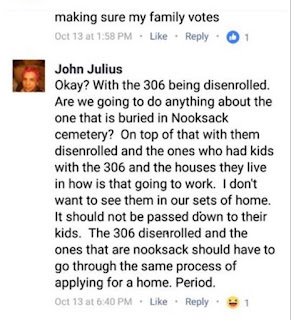 Because disturbing the DEAD is how the NOOKSACK ROLL? Kelly Faction is beyond shameless. We at Original Pechanga's Blog would like to thank all our veterans from each branch of service for their sacrifices. Here is an appreciation of a father, by his son, ME, that we wrote for last year's Veteran's Day. On this Veteran’s Day, I want to remember my father, Felipe Cuevas, born July 13, 1928. 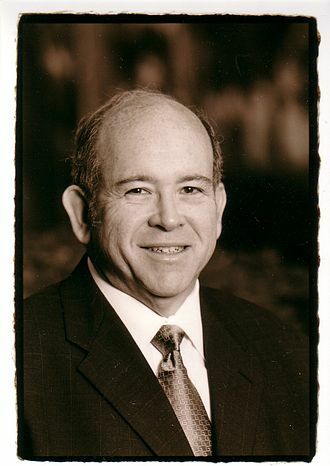 He was the son of Phillip and Olive Cuevas. 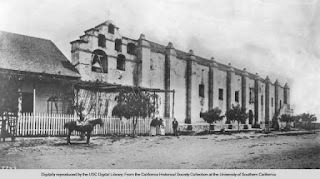 Olive was the daughter of Mary Ann Miller, who, in turn, was the daughter of Paulina Hunter of Pechanga. Paulina was the matriarch of the Hunter Clan who was given her 20 acres of land on the Pechanga Reservation as the head of the Family by President McKinley. 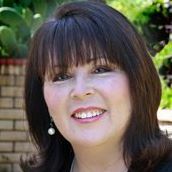 Her Pechanga Ancestry was proved by noted researcher Dr. John Johnson, who was hired by the Pechanga Enrollment Committee, using Pechanga's own records. My father grew up in Los Angeles, attending Malabar Elementary, and a graduate of Roosevelt High School. He the oldest of five children, all of whom served in our military, including his sister Mary Ann Poole and his eldest sister, Matilda Smith, who is the eldest now of the Hunter Family. He entered the U.S. Army in 1948 and served in many capacities, primarily as a drill instructor. He was stationed in Germany, where his wife Alice bore a son,serving as well in South Korea, Ft. Ord, CA (three times), Ft. Lewis, WA where I was born, and Ft. Benning, GA. At all of these posts he trained young men to serve our country. He served two tours in Vietnam, once an advisor with a South Vietnamese Army Battalion, both tours were near the end of his 23 year career. He always taught us about our family roots at Pechanga, having helped to build the cabin on Hunter Lane in 1957 with his cousins and uncles. My first time on the reservation was when he served his first tour in Vietnam in 1966. My Aunt Tillie and Uncle Bars took my brother and me to spend time at the cabin. That was when you could still hunt on the rez, for rabbit and dove. He was proud to be Pechanga and he was happy that family members were able to bring us to the reservation while he was in Southeast Asia. At that time, there were few homes on the reservation. It wasn't until after the casino came and many found out that they could avoid state income taxes did they move there ... or build there. 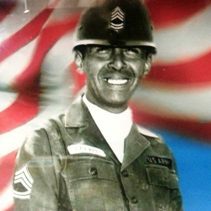 For heroism in connection with military operations against a hostile force: Sergeant First Class Cuevas distinguished himself by heroic action on 3 July 1967 while serving as Light Weapons Infantry Advisor to the 1st Battalion, 48th Infantry Regiment, Army of the Republic of Vietnam. On that date, the Viet Cong opened fire on the battalion headquarters compound with machinegun, small arms and 82mm mortar fire. Eight Vietnamese soldiers and dependents were seriously wounded during the initial phase of the attack and an aerial evacuation was requested. Sergeant Cuevas voluntarily proceeded to the helicopter landing area. Sergeant Cuevas remained in the exposed area assisting in sorting the wounded and determining priority for evacuation. Only when all wounded personnel were safely aboard an aircraft and airborne did Sergeant Cuevas return to a safe position. As result of Sergeant Cuevas’s prompt and courageous efforts, the rapid and efficient evacuation of all wounded was accomplished. Sergeant First Class Cuevas’ heroic actions were in keeping with the highest traditions of the United States Army and reflect great credit upon himself and the military service. My father was also awarded the Bronze Star. You don’t “win” these by the way. But he was proud of his service, proud that he was able to make young men ready to defend themselves and our country. After surviving two tours in Vietnam and countless hours in the field training our military men, he died of a sudden heart attack in April 1979. Sadly, he was never able to enjoy the largesse that came with the successful opening of the Pechanga Resort and Casino, which brought much needed funds to the reservation and our people. 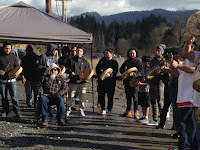 Conversely, he also was never able to feel the sting of seeing his birthright ripped from his family, which now includes five grandchildren and 6 great-grandchildren by a "disenrollment" committee that included: Ruth Masiel, Ihrene Scearce, Frances Miranda and Bobbie LeMere. Pechanga proudly displayed his name as a Pechanga Veteran on their website, along with his brother and sisters, yet now, they also say, HE IS NOT PECHANGA. Pechanga has disrespected all their veterans by removing their veteran's page, because most of the veteran's were Hunters. 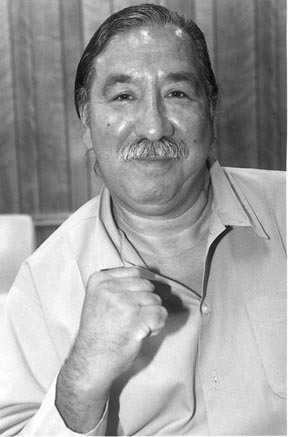 On July 13, 2006, on what would have been his 78th birthday, the Pechanga Tribal Council heard our family’s appeal of our unconstitutional disenrollment and later did not allow our appeal. Much of that story is written here on this blog. My father always encouraged my brother and me to do our best, to do what is right and THAT is why we continue to fight for our rights and against the evil that has been done to our family. We may not be triumphant, but we will be successful in shining a light on the corruption in the tribe and forcing them to defend their disgraceful actions. Dad, thank you for all that you gave to your family and to your country. I am proud to be your son. It is shameful that Pechanga doesn't reward your memory by following the rule of law and the will of the people. Even more scurrilous, the Pechanga Tribal Council has seen fit to remove it's page honoring tribal veterans. TO ALL OUR VETERANS: THANK YOU FOR YOUR SERVICE. Feel free to discuss YOUR family veterans in our comments. 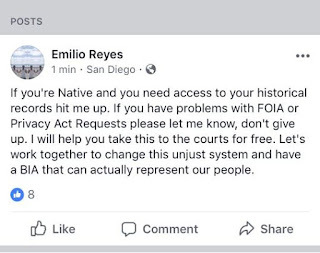 Emilio Reyes, Tongva researcher, has a great post up in the DAILY KOS explaining his most recent FOIA lawsuits due to BIA failures to comply. I have been conducting extensive research in the records of the Bureau of Indian Affairs (“BIA”) for many years now. During my five years of research, I’ve located important historical records that relate to my personal ancestry and other members of my tribe. Subsequently, I started researching many family lines in different tribes, including Pechanga, Pala, San Pasqual, who have been affected via tribal disenrollment. 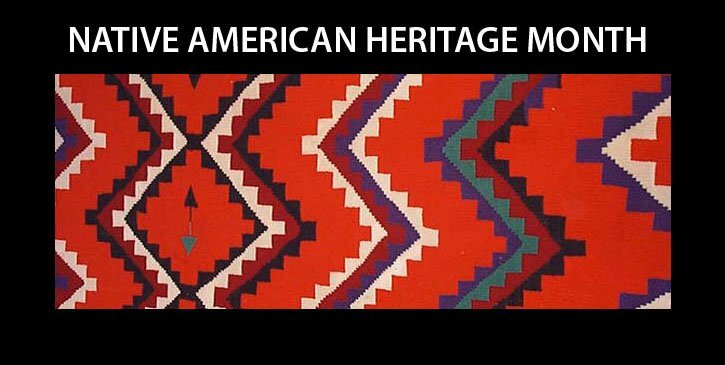 This month-long holiday is a time to celebrate rich and diverse cultures, traditions, and histories and to pay homage to the important and numerous contributions of Native American people throughout the centuries. Left unsaid is the issue of over 11,000 Native Americans who suffered the abuse of tribal disenrollment, moratoriums and banishment at the hand of their own tribes. This holiday month presents the PERFECT opportunity for tribes to restore their people to their rightful place in the tribe, to bring all the people home. We have been writing this blog for over a decade. That's much too long for tribal people to be out in the wilderness and for too many young Native Americans to be born without their rightful heritage. Each picture on my left sidebar tells a different story, there are also numerous links to tribal stories of their heritage and rights ripped by corrupt councils. Proud to be able to publish the beginnings of the story of the Wilton Rancheria Disenrolled and the BLUE family. 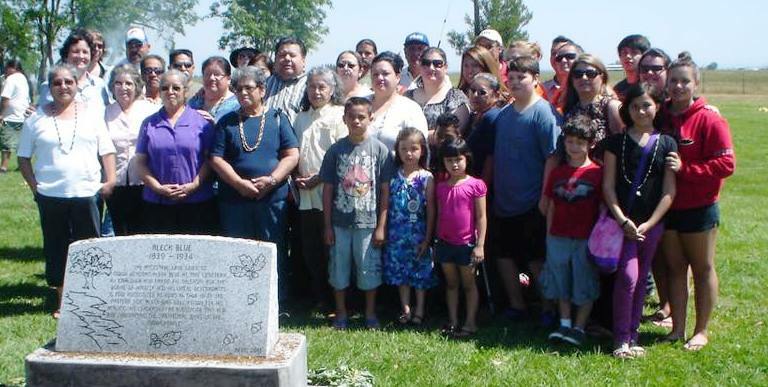 This story is repeated many times in Indian Country, yet very little help is available. This will be in multiple parts, so please, share and look for the installments. 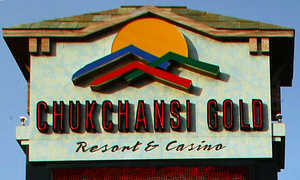 I'm told it was a pretty eventful night at Picayune Rancheria of Chukchansi Indians' monthly tribal council meeting. The general council had spoken loudly and clearly with their vote that REID was not their choice. Hammond's removal is now on the new council's agenda for review....we shall see if this much needed transparency continues. Restoring the honor of this corrupt tribe is a long road. WHO ELSE is on Chukchansi's chopping block? An attorney perhaps? 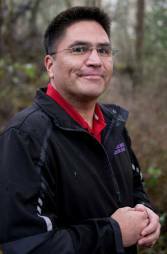 Is it time for change at Nooksack? Or, PAST time? "The court has serious concerns about the legitimacy of the tactic that Allergan and the Tribe have employed," Bryson writes. In his view, Allergan has paid the Tribe to "rent" its sovereign immunity at the US Patent Office. If that ploy succeeds, any patentee facing IPR proceedings would presumably be able to defeat those proceedings by employing the same artifice. In short, Allergan's tactic, if successful, could spell the end of the PTO’s IPR program, which was a central component of the America Invents Act of 2011. We can't have ANOTHER tribe interfering with MARKET SHARE, no matter HOW many Native Americans are helped. Since Chuckchansi harmed so many of THEIR OWN PEOPLE, who among them CARES about their brothers and sisters in another tribe. The Picayune Rancheria of the Chukchansi Indians sought to upend another California tribe’s plans to build a Las Vegas-style casino less than 30 miles from its own on Friday, warning a D.C. Circuit panel that the project would be disastrous to its bottom line. The website about S. California and Los Angeles, LAist has a story up about the Gabrieleno Tongva people that might make one or two factions upset. Until the groups come together....federal recognition will be elusive. California was home to thousands of people before Spanish settlers arrived—around 350,000 across the whole state—and the Los Angeles Basin in particular was home to the Gabrieliño-Tongva people. The movements of the Tongva peoples set the stage for what would eventually become Los Angeles. Their footpath through the Sepulveda Basin was the original 405 freeway. The L.A. State Historic Park was formerly a fertile basin within a mile of Yaanga, the Tongva people’s largest known village in the area. With the fire headed toward the Elem Colony, evacuations were ordered there not long after dispatch as well as at nearby Orchard Shores. In Lake Village Estates, transformers were reported to be blowing. 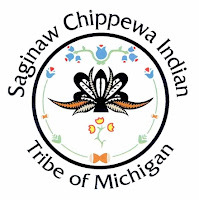 Our friend Michelle Hammock, Hopland disenrolled reports her parents home is destroyed..
Saginaw Chippewa Disenrollment: Lawyer brings VICTORY for ONE Family the MAYS, LOSS for Another? Interesting how things turn out. ONE LAWYER, Two cases, same wording on standards, yet two different outcomes? "Under the legal standards in effect on the date their membership was certified." All the previous that were disenrolled should have theirs overturned as well under that language. There will be a segment at the upcoming CALIFORNIA INDIAN LAW ASSOCIATION meeting on TRIBAL DISENROLLMENT. The segment looks like it's shaping up to be a HOW TO Disenroll with 2 of 3 panelists on the ...PRO disenrollment side. Eddie Crandell - Tribal Chairman, Robinson Rancheria of Pomo Indians The LONE panelist who brought HONOR back to Indian Country, by bringing his disenrolled people HOME..
We wrote about BIA DIRECTOR AMY DUTSCHKE'S niece Sara, who tried some threatening tactics while 'representing" the Pala Band of Mission Indians. Former tribal chairman of Pala King Freeman was concerned for his LIFE. Other speakers include ANNA KIMBER, who represented the Jamul Indian Village who BEAT and evicted some of their people. And Loretta TUELL, who was VERY upset that Osama bin Laden was given the codename GERONIMO, but silent on the abuses of 11,000 Native Americans. NO WORD on whether SHOWERS will be provided to reduce the slime. Wonderful news! Oh, wait. Word is out that the Oneida Nation, which bulldozed the chairman's own family's homes (under his orders) will donate their assets of Indian Country TODAY to the National Congress of American Indians which studiously and repeatedly IGNORES the issue of tribal disenrollment. Can we even HOPE to see stories on the abuse of Indians....BY INDIANS? Wonder if the new owners will report on the TAMMY MAHONEY investigation? The defunct Indian Country Today Media Network will remain in Indian Country's hands thanks to the Oneida Nation. 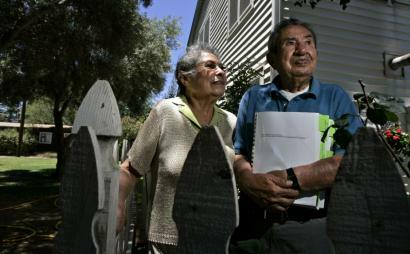 Sierra Star News has the story of the Picayune Rancheria opening enrollment. All is NOT as it seems. For the first time many in the tribe could remember, the Picayune Rancheria of Chukchansi Indians announced it will allow open enrollment, mere days before its annual council election Saturday, Oct. 7. 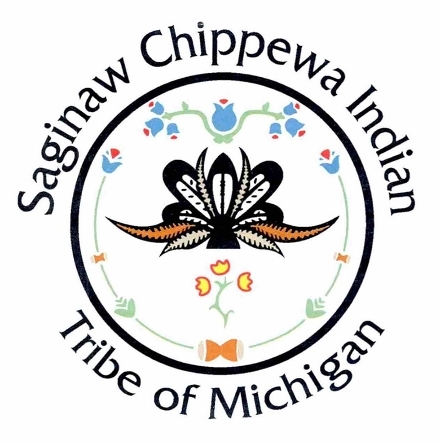 In a statement put out on the tribe’s Facebook page Friday, application packages will begin to be sent to enrolled members Monday. I can only hope that NONE of you were touched in any way by the Las Vegas Mass Murder...sadly, our family and friends have been..
Cousin's friend was shot in the shoulder. SIL's friends daughter was shot twice but will survive.. 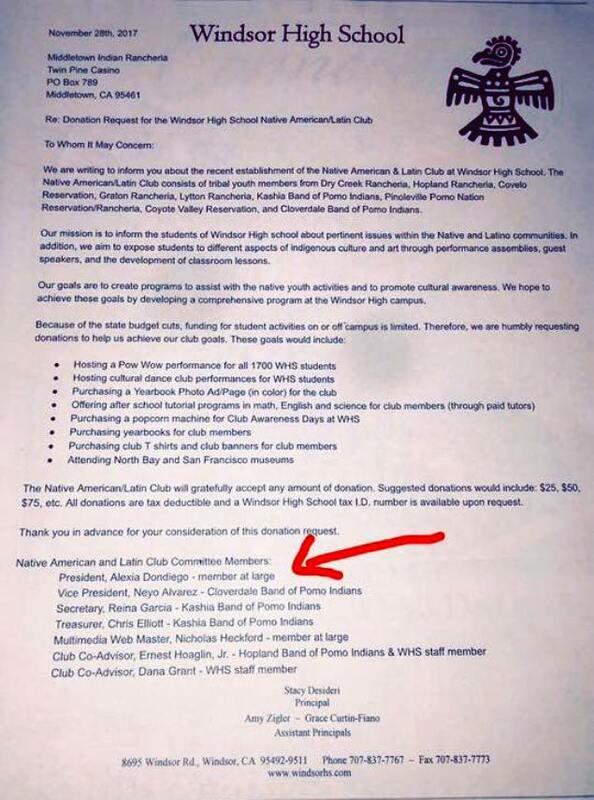 I am so proud of my cousin Olivia Walls who penned this account of her experiences at the Los Angeles City Council Meeting which resulted in a 14-1 to change Columbus Day to Indigenous people's day. Please, READ it and SHARE it. Cherokee Nation Attorney General Todd Hembree issued the following statement in the ruling of Cherokee Nation v. Nash, et. al in the U.S District Court for Washington D.C.
“Yesterday, a Federal Court issued a long awaited ruling determining the rights and interests of Cherokee Freedmen descendants. 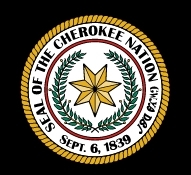 The Court ruled that Freedmen descendants have the right to citizenship within the Cherokee Nation.